Rafal Blechacz plays Chopin’s polonaises: emotional, popular & poetic music from one of the greatest young pianists of his generation.
. . . [this disc is] of exceptional distinction. If we think of Chopin's polonaises as a multifaceted musical manifestation of the character of his native Poland -- its pride, its spirit, its vulnerability, its sorrow -- all those qualities are identified and brought into the potent interpretative mix of Blechacz's performances. He has the requisite power to assert his presence, as Chopin so often does at the start of these pieces, but he also has the breadth of understanding to temper his tonal strength, depth and muscle with tenderness, lyrical warmth and a pianistic palette of both rich and delicate colours. Take the particularly well-known A major Op 40 No. 1. Here Blechacz has complete command of the music's swagger and healthy outlook, subtly maintaining the distinctive, propulsive polonaise rhythm in the bass and, with thoroughly natural inflections to the music's pace, making the piece gleam with an exhilarating freshness. Then in the contrasting C minor Op 40 No. 2, Blechacz conveys something much darker, more explosively passionate, more disturbingly restless. Blechacz reaches to the heart of the seven works in this programme, his expressive personality finding a compelling accord with Chopin's own.
. . . Rafal Blechacz certainly has something to say about Chopin . . . Much of this release is exhilarating . . . Blechacz plays with freshness and verve. He understands instinctively how Chopin elevates the traditional Polish dance into a national statement, with a sound that is both proudly majestic and melancholy. Displaying a brilliantly secure technique, the young Polish pianist is fully up to the challenges of these glittering pieces. He also feels the nostalgia and longing of the music, and hearing him to play the Polonaises is like hearing an authentically Viennese performance of a waltz, with plenty of air in those idiomatic hesitations. The A flat Op. 53 is every bit as fiery as its "Heroic" title suggests, while the haunting C minor work, Op. 40 No. 2, is full of restless spirit.
. . . [Blechacz] certainly has something to say about Chopin . . . exhilarating . . . Blechacz plays with freshness and verve. He understands instinctively how Chopin elevates the traditional Polish dance into a national statement, with a sound that is both proudly majestic and melancholy. Displaying a brilliantly secure technique, the young Polish pianist is fully up to the challenges of these glittering pieces. He also feels the nostalgia and longing of the music, and hearing him play the Polonaises is like hearing an authentically Viennese performance of a waltz, with plenty of air in those idiomatic hesitations. The A flat Op. 53 is every bit as fiery as its 'Heroic' title suggests, while the haunting C minor work, Op. 40 No. 2, is full of restless spirit. What I particularly admire in young musicians is the overriding drive for clarity of texture, articulation and touch, all of them major virtues in Blechacz's readings of these most familiar of Chopin's works. That he goes on to give each a sharply delineated character and finish (not preclusive of highly imaginative spontaneity) makes this CD such rewarding listening. That he ends the CD with the great Polonaise-Fantasie in A-flat is clearly an artistic choice, and the playing is remarkable for its complete lack of mannerism but exhaustive investigation of the work's poetry, delicacy and cumulative fire.
. . . remarkable . . . On a fine instrument that is very well recorded, Blechacz's playing has everything one could ask for -- brilliant technique, panache, musicality, and a feeling for the peculiar inner rhythms that link the polonaise to the mazurka . . . As much as I admired his Preludes, this album is better, with every mark of the mature interpreter . . . Blechacz encompasses the thrilling F-sharp Minor Polonaise (No. 5) in one confident sweep . . . Blechacz gives no quarter in his headlong enthusiasm to make these pieces thrilling, and the fact that he can is recommendation enough.
. . . [der Name Blechacz steht] für hochrangiges, ernsthaftes Musikmachen . . . [er zeigt], dass mit Chopin ein völlig neuer Polonaisen-Ton entstanden ist, weg vom harmlos Folkloristischen, hin zu komplexer Kunstmusik . . . er gibt sich nicht mit Kuschelklassik zufrieden, sondern zeigt die Ecken und Kanten dieser Musik, ihre stets gefährdete Eleganz und die Dichte der Ereignisse. Nach dem Gewinn des berüchtigten Chopin-Wettbewerbs in Warschau im Jahr 2005 hat er der Klassikwelt gelassen bewiesen, welch grosser Pianist er ist, welch reifer Künstler er werden wird . . . [er zeigt] einmal mehr, wie sensibel er sich in die Musik . 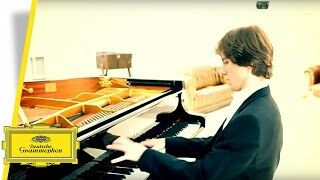 . . seines Landsmannes Frédéric Chopin einhört, wie klug er deren Höhepunkte findet, wie klangsinnlich er sie geniessen kann, wie entschieden sie tönten. Blechacz verleiht ihnen durch seine Wahrheitssuche einen revolutionären Geist. Die triumphalen Stücke durchtanzt er rauschhaft, und doch bleibt am Schluss sein Kopf klar. Faszinierend. Blechacz holt nicht primär das Salonhafte von Chopins Musik heraus, er zeigt die Ecken und Kanten dieser Werke, ihre stets gefährdete Eleganz und die Dichte der Ereignisse. Eine Aufnahme voller Schwung und innerem Feuer, voller Schattierungen und Klangfarbspiele, Geschmeidigkeit und Geschmack.
. . . die neue Aufnahme [knüpft] nahtlos an seine vorausgegangenen Aufnahmen an und hält deren herausragendes Niveau. Sein Spiel ist punktgenau sauber, bleibt . . . immer beweglich und transparent . . . [wirkt] in jedem Augenblick voll konzentriert. Hörenswert, eigenwillig. Neu und überraschend ist . . . sein interpretatorischer Ansatz: Blechacz spielt die Polonaisen mit unüblich nervöser Energie, sieht in ihnen weniger stilisierte Tanzsätze als oft eingedunkelte Charakterstücke . . . pianistisch knüpft die neue Aufnahme nahtlos an seine vorausgegangenen Aufnahmen an und hält deren herausragendes Niveau. Sein Spiel ist punktgenau sauber, bleibt auch in den vollgriffigen Partien immer beweglich und transparent, lässt das Tempo zwar oft überraschend stark schwanken, wirkt dabei aber in jedem Augenblick voll konzentriert. Hörenswert, eigenwillig.
. . . [Blechacz interpretiert] mit rhythmischem Biss, gesanglich leuchtender Phrasierung und romantisch rubatosatt. Ganz im Sinne eines traditionellen, aber hier blitzblank brillierenden und erfrischten Chopin-Bildes. Das macht er großartig . . . so beseelt, als finde er in der Spezialisierung, welche andere als Beschränkung auffassen könnten, sein wahres Paradies. Raffiniert die unterdrückten Revolten der linken Hand in der As-Dur-Polonaise. Ingeniös sein Ansatz, die ursprünglichen Hochzeits-Tänze als etwas Erlittenes, Unausweichliches, tragisch Notwendiges geltend zu machen . . . einer der wenigen Großmeister seines Fachs. Fabelhaft. Was er hier in seiner Sammlung der sieben späten Polonaisen von Chopin bietet, hat künstlerischen Ausnahmecharakter . . . Unter Blechaczs Händen erhält jedes Stück eine je individuelle Zeichnung. Mit überwältigender Pianistik, mit modulationsreichem Ton und elastischer Tempodosierung geht er auf die vielen halb verdeckten Verdunkelungen und Sehnsüchte von Chopins Polonaisen-Ästhetik ein. Feurige Attacke und poetischer Zauber, depressive Melancholie und herzzerreissende Verzweiflung halten sich dabei in einem sozusagen labilen, also stets spannenden Gleichgewicht. Einmalig.